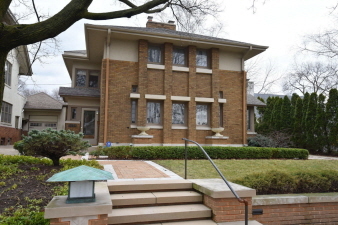 This amazing home, done in Frank Lloyd Wright style, was designed by Russell Barr Williamson. Fantastic Shorewood location, on a quiet cul-de-sac and one block west of Atwater Park and Lake Michigan. Great kitchen, open to family room. Large living room with natural fireplace and adjacent sunroom. Dining room with built-in china cabinet and original tile floor. Huge master suite with newer bath and fabulous attached library/den with natural fireplace. A newer roof caps off this truly wonderful home.